Open your own Tax Business. The 1040TaxBiz Business Simple Package makes it easier for you to start your own tax preparation business hosted at a location of your choice. The 1040TaxBiz Business Package makes it easier for you to grow a tax preparation business hosted at a location of your choice. The 1040TaxBiz Corporate Package makes it easier for you to grow and expand a tax preparation business hosted at a location of your choice. I am Gloria Harris, President of 1040TaxBiz. I know at times it can be difficult and confusing when getting a new business up and running but you are not alone in your efforts. As the number of taxpayers continues to grow, so does the need for qualified tax professionals. It is important for taxpayers to claim all of the credits and deductions due to them and pay no more than the exact amount of taxes they owe. Starting your own tax business will enable you to meet this growing demand and also give you the flexibility and security you deserve. Millions of Americans pay a tax professional to prepare and file their tax return every year and Congress continues to make more changes to the tax code. These changes make taxpayers even more confused and frustrated as they are seeking out the help of a tax professional. At 1040TaxBiz, we have affiliates across the country, and each one of them have their own success story to tell. One of our affiliate in Mississippi has made over 150K in a single tax season with 1040TaxBiz and has renewed her partnership for the last 10 years. Another success story comes out of Texas a made over 200K in a taxes season as an affiliate with 1040TaxBix. We have an affiliate in California who made over 68K in their first year with 1040TaxBiz! What separates affiliates who are successful from affiliates who aren’t is the hustle! It is hard work and dedication that brings the business to your location. At 1040TaxBiz, we have affiliates across the country, and each one of them has their own success story to tell. 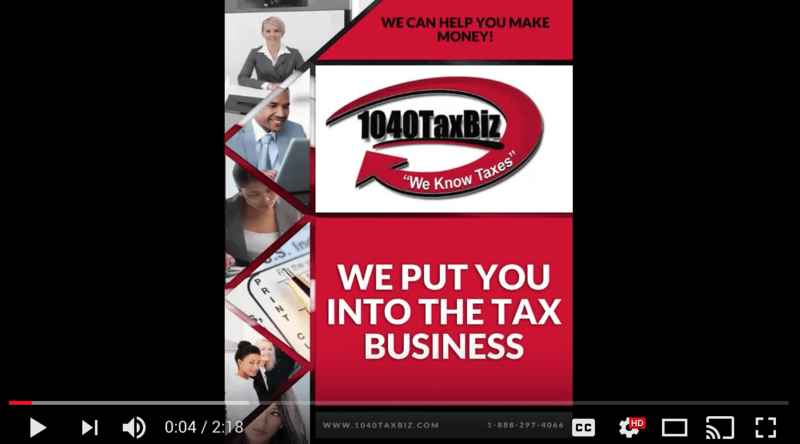 One of our affiliates in Mississippi has made over 150K in a single tax season with 1040TaxBiz and has renewed her partnership for the last 10 years. Another success story comes out of Texas where an affiliate a made over 200K in a taxes season as an affiliate with 1040TaxBix. We have an affiliate in California who made over 68K in their first year with 1040TaxBiz! What separates affiliates who are successful from affiliates who aren’t is the hustle! It is hard work and dedication that brings the business to your location. We will provide you with all the training and resources you need to be successful, but we can’t provide the motivation and dedication it takes. The difference between our successful affiliates and those who are not successful with our tax business is putting in the time and utilizing the training and resources offered. Take the time to review the valuable information as well as our online tax school, www.1040U.com. If you just want to talk, know that my sales team will give you the time, space and counsel you need to help you choose the right business model(s) for you. We enjoy providing the best service possible, whether it is to our customers, vendors or our affiliates. If you have any questions about us, here at 1040TaxBiz, simply click on contact us now. We will do our best to assist you. Our purpose is to assist our affiliates in successfully starting a tax preparation business. We know taxes. We know people. We can help you make money. We will strive to provide an excellent training and technical support system that will exceed our affiliates needs. Our tax and office management software platform will be constantly upgrade to meet the IRS’s ever- changing requirements and standards. We promise to listen ￼ research and share effectively and tax information with our affiliates as it becomes available to ￼ At 1040taxbix, we assist our affiliates in bringing the business to its fullest potential. We have honed and perfected a system that will take any new entrepreneur with little or no experience form inception to profitability. If you are a ￼ tax preparation veteran, we will help you expand and grow your business. We only ask the you have the heart and to succeed and follow our system. We are committed to giving you the knowledge and tools to reach financial goals. Our purpose is to assist our affiliates in successfully starting a tax preparation business. We know taxes. We know people. We can help you make money. We will strive to provide an excellent training and technical support system that will exceed our affiliates’ needs. Our tax and office management software platform will be constantly upgraded to meet the IRS’ everchanging requirements and standards. We promise to listen affectively, research and share tax information with our affiliates as it becomes available, and bring the business to its fullest potential. We have honed and perfected a system that will take any new entrepreneur with little or no experience from inception to profitability. If you are a seasoned tax preparation veteran, we will help you expand and grow your business. We only ask the you have the heart and the desire to succeed and follow our system. We are committed to giving you the knowledge and tools to reach your financial goals. Discover a seasoned team of 1040taxbiz experts. All Dedicated to applying there decades of experience to helping our clients with their business needs. Stop dreaming of financial independence. Be your own boss! Discover why people start their own tax business and see how being your own boss is different from buying a franchise. Are you ready to change the game? Start your own tax business now! Find how to open or start an income tax preparation business, office, practice or service in the United States. For those on the west coast, we can schedule late evening calls. ©2018 1040TaxBiz. All Rights Reserved.